All transactions are safe and secure with a reliable history in online purchasing behind each of our associates. 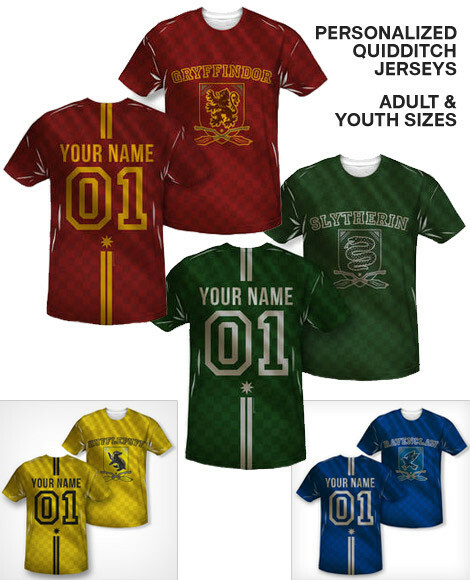 Buy the Personalized Quidditch Jerseys (Name and Number) t-shirt to own Harry Potter clothing and merchandise. Hang your HP Half-Blood Prince t-shirt in the closet for these awesome Personalized Quidditch jerseys inspired by the sport of wizards and witches. Now you can join the house of your choosing. Pick your own personalized name and number. Wear it to support Harry whether he's playing in a match or engaging in a wand battle with Lord Voldemort. In their seventh year, Harry, Hermione and Ron drop out of Hogwarts in search of Voldemort's remaining Horcruxes. They learn about Albus Dumbledore's past and Hogwarts professor Snape's true motives. Voldemort and the Death Eaters continue villainous acts in the magical and Muggle worlds. Prepare with Deathly Hallows and Half-Blood Prince merchandise. In addition to the Personalized Quidditch Jerseys (Name and Number) tee above, browse the Harry Potter Clothing Gallery for more apparel like men's and women's clothes, kids shirts or hoodies.